Founded in 1919, the Polish Football Association (Polski Związek Piłki Nożnej in Polish, and PZPN for short) is the governing body of football in Poland and is in charge of the Polish national team as well as organizing the top tier league and various tournaments. The PZPN will have its moment in the global spotlight in 2012 when the UEFA European Football Championship is played in Poland and Ukraine. 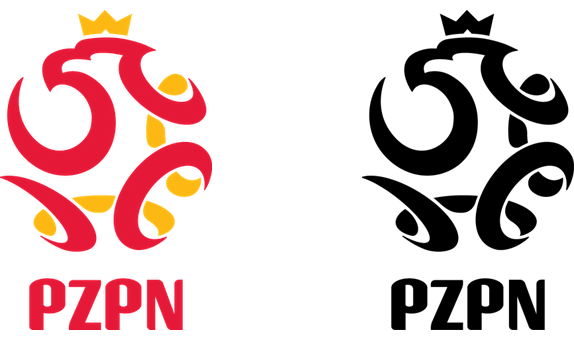 A new logo for the PZPN was introduced last month, designed by Warsaw-based SaltPepper Brand Design. Live presentation of the logo. Epic. Making-of the logo. In Polish. The new logo retains the exact same elements as the previous version — an eagle, a crown, and a soccer ball — with contemporary flair (i.e., gradients and ribbon-ey thingies) and in a more integrated manner. It might be easy to be swayed by the nostalgia exuded by the old logo but, let’s admit it, it wasn’t that good. The eagle was weird and the soccer ball looks like clip-art with the typography being its only saving grace. The new logo isn’t the best thing I have seen all year, but there is some cleverness and ingenuity to it and once you get rid of all the gradients, as seen in the last two versions above, the logo is remarkably strong and dynamic. It’s not visually stunning, but it has a good energy and confidence to it. The typography is weaker than the previous one and clashes a bit with the icon — actually, it clashes with a lot of things. The new logo looks much more marketable and merchandise-able now and more flexible now that the type is separate from the icon. A good evolution in my mind, but I can see how this could turn off a few folks. Thanks to Plamen Jordanov for first tip.